Pearls from the last century to last week, from the evocative to edgy, bank-breaking to budget, all for my lovely flaneuses. Pearls are June's birthstone, not that you need a reason. Ca. 1910 Seed pearl 10k pendant/brooch. 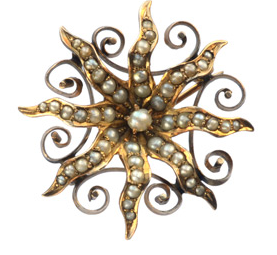 Freshwater seed pearl one-inch Edwardian brooch that can also be hung as a pendant. Grace personified; price $175 from Erie Basin. Natural wild abalone pearl ring, rare and intense. A simple setting for an organic gem. Pearl is about 12mm x 14mm. Price, $1,275 from Kojima Company. 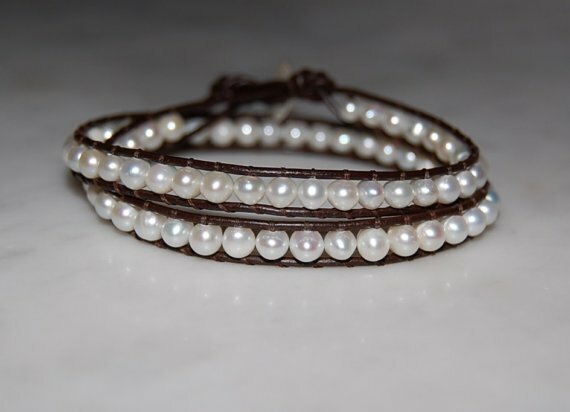 Freshwater pearl double-wrap leather bracelet; price $44 from Etsy seller thewatersedge. Would make a charming gift for a friend or June grad. Ca. 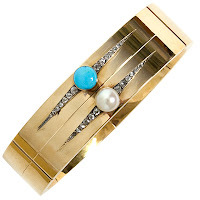 1890s Victorian 14k, pearl, mine-cut diamond and turquoise bangle. Let's pause to admire the exquisite workmanship of the era. Price, $4,850 from 1st Dibs seller Stella Rubin. 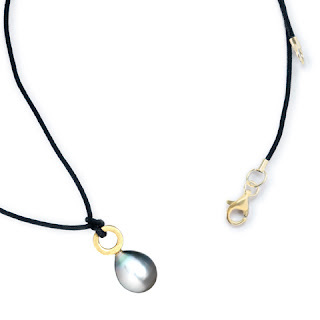 One 10mm grey South Sea pearl on a black cotton cord, beautifully set. All you need in the neckline of a blouse. Price $85-$150 depending on metal. From Kate Hines Jewelry. 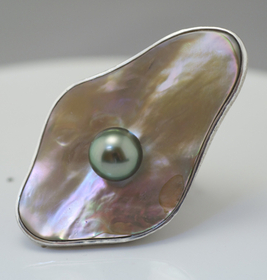 For those who love drama, this ring is sensational: 2.5 inches of undulating abalone shell holding an 11mm natural colour pistachio Tahitian pearl, set in silver. Notice anything new, dear? Price, $650 from Kojima Company. Whoever said pearls are boring can go slurp a mollusk. 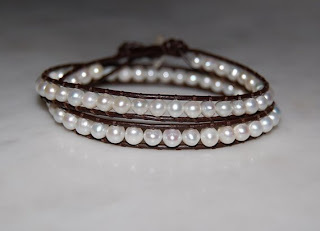 One or a strand, old or new... June (along with eleven others) is the month for pearls. I love the sunburst brooch and the wild abalone ring. I always enjoy your pearl posts. That brooch is gorgeous. And the abalone ring on the bottom...wow!! You always find the best pearls, Duchesse. That bangle looks so modern! Beautiful. I would happily wear any of these pieces. Oh, I wanted to mention that yesterday I spoke to the loveliest lady. She had called our office because she had read about us on your blog. We started chatting and I found out that she read your blog, Privilege, Une Femme etc. I'm always amazed at the interconnectedness (is that a word?) of otherwise unconnected people because of the blogosphere. Oh, my. That last ring is stun-ning. Want. Need your thoughts on this... I had a custom necklace designed from one of "our" favorite pearl designers. It was quite an effort to find the right pearls, clasp etc and took awhile. I received the finishednproduct, and now maybe 6-8 weeks have gone by. I've worn the necklace repeatedly, because it fits the "wardrobe need" but to be honest, I don't adore it. It is fine, good, very beautiful, but it isn't quite right. The pearls are not quite right, even though I okayed them from a photo. Should I contact the designer? Should I stop being so picky/hard to please and just say enough? Should I contact the designer? I recently bought a strand of faux gumball pearls that I had restrung with loads of freshwater 6-7mm pearls to create a 60 inch rope and am having fun wearing it right now as a triple layer with my polka dot shirt!! The size contrast is stunning though the large ones are 'shell pearls' and therefore fake, of course. Me too enjoy your pear posts. Spacegeek: Definitely, send back and have conversation; you should have the pearls you want, and (taking a guess where you got them), designer wants you to be thrilled, too. You might have to pay for the rework and also for the pearls if you are making a jump in size and/or quality, but it's worth it. When considering other pearls, ask her to shoot them in natural light so the conditions are as close to how they look when you wear them as possible. re your last sentence, there are some women who are *never* pleased. I have no idea if you are like that, but you will know. AN: That will be fun, and you are able to knot pearls yourself, a talent I envy. Belle: Love it when that happens. I have not deals to promote any products and a mission to find great sources. Very happy she found you. 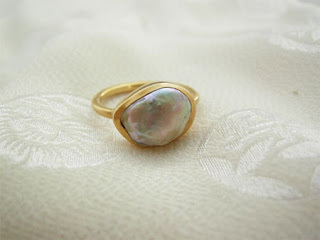 Susan, une femme, Rubi, AN: So who's the lucky one with the abalone ring? The wild abalone ring is just gorgeous.